Using a photo is always a risky design option. This bag features the sea, some sky and a bowl of Crisps poking out of the side. 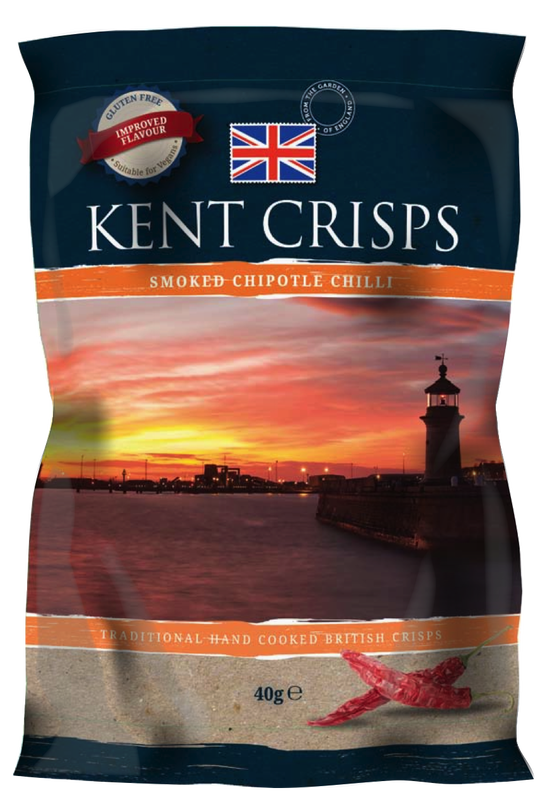 It does not really do the job of persuading consumers of the delights of Kent, and does nothing to build a brand or sell Crisps. It could just as easily be for any foodstuff. The outstanding level of seasoning on these Crisps worked against them in the Crunch department. They were thick and meaty and sufficiently so, that the crunch was more biscuit than crisp and crunchy. These Crisps were thickly cut. They were orange in colour. There were meaty and whole oil blisters. There was plentiful seasoning powder. There was skin in edges. In short – perfect. A Nose Plunge Test revealed little. There was a slight smokiness, but nothing like the taste – the smokiness shone through brilliantly. This is very much an American flavour, but this typically British company have made a very worthy attempt at introducing the flavour their buying public. They could have done with a bit more heat, but Chipotle Chillis are not among the hottest, so fair enough. Overall, the flavour was commanding yet subtle.